Join us on our tour between cities of the former Austrian-Hungarian Empire, Vienna and Prague. Experience not only these two capitals of Austria and the Czech Republic, but also many historical, well-preserved towns and the beautiful nature and countryside between them. After exploring Vienna, we get on our bikes and follow the Danube River for a couple of days, all the way to the beautiful wine region of the Wachau Valley, having a taste of the renowned regional wine and visiting the great Melk Abbey with its breathtaking views of the Danube River. We then head north towards the Czech Republic where we explore the beautiful town and region of Trebon - full of lakes, forests, meadows, and golden farmland. We continue to Cesky Krumlov, a fairy-like town, the jewel of southern Bohemia and a UNESCO designated World Heritage Site. You will not find another town like this anywhere else. After spending two nights there we proceed to Ceske Budejovice, the provincial capital of Southern Bohemia. It has not only a beautiful historical center with a stunning Baroque square but is also the home of the original Budvar (Budweiser) beer. We will tour the brewery and you will have the option to judge for yourself how good this beer is. Finally, we transfer to Prague where we have an introductory walking tour of the city center and our farewell dinner. We encourage you to come to Vienna a few days prior to the tour start date and to stay in Prague a few days after the tour in order to explore these beautiful cities in more detail. There is plenty of accommodation available in Vienna and Prague but for those interested we can reserve a room for you at the same hotels we stay on our tour. 7 nights lodging in selected 3-star to 4-star hotels and pensions. Walking tours, including sightseeing in Vienna and Prague. Excursion fees to selected castles, and a tour and beer tasting at the original Budvar Brewery, which makes one of the best beers in the world. Option for extended stay in Vienna and Prague. After you check-in (for those who are just arriving), we will have a bike fitting session to make sure all the bikes are properly adjusted for the next day. We will regroup at the reception at 2 p.m. and set out for our two-hour introductory walking tour of Vienna with a professional guide. In the evening, we will meet for a welcome dinner and orientation meeting. After breakfast we cycle out of Vienna on a bike path, following the Danube. When the path becomes unpaved, we transfer to Krems, a thousand year old town on the Danube, about 50 km further west, and gateway to the Wachau Valley. The historical center of Krems is on the UNESCO World Heritage List and it is one of the most beautiful historical centers in Europe. You can stroll through this easy to navigate town in the afternoon and admire some of its architectural sites. Since Krems and the Wachau Valley are part of a wine region with very specific soil conditions, we will have a small wine tasting of the excellent local wines (especially white) just before dinner. Today, we will ride through the beautiful Wachau Valley, one of Europe's loveliest river landscape areas, more or less still following the Danube. We will arrive at the small town of Melk just in time for lunch. We visit the famous and beautiful Melk Abbey, set on a hill about 60 meters above the Danube. The abbey is one of the most important Baroque buildings in Austria. 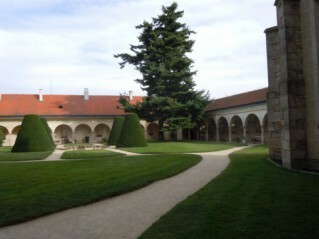 After our visit of the Abbey, we will leave the Danube and transfer to Trebon in the Czech Republic. This beautifully preserved Renaissance town dates back to the 11th century and has been famous in the past for its fishing industry. Towards the evening, you can wander about this easy-to-navigate picturesque town and visit the beautiful Renaissance chateau gardens, then enjoy some beer at the town's 16th century brewery, perhaps accompanied by a dish of fresh water fish, arguably the best in the country. As we enter a wooded region abounding with sparkling lakes, artificially made for fish raising (mainly carp and trout) already in the 1500's, the terrain is at first flat. We continue on winding back roads through more beautiful hamlets and some of Europe's oldest nature reserves dating back to the 1800’s. We then ride to Cesky Krumlov, the jewel of southern Bohemia and a UNESCO designated World Heritage Site. You will not find another town like this anywhere else. Cesky Krumlov was situated on the main trading route between Bavaria and Italy, which explains its splendor. 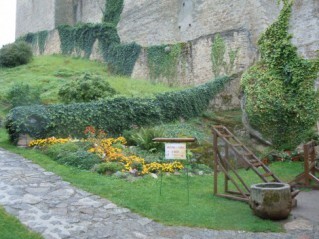 We'll enjoy a dinner, an evening stroll, and two-night stay in this unbelievably beautiful and preserved medieval town. In this town, you may also have one of the most memorable dining experiences of your life. We will have our dinner in a medieval dungeon, which has become one of the most popular restaurants for locals and tourists alike. Sometimes even with live gypsy music. In the morning, we will have a tour of the amazing Cesky Krumlov Castle. After that you have different options to pick from. 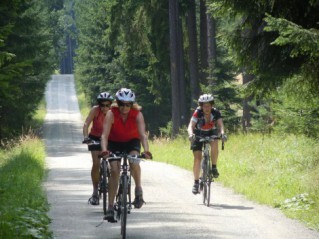 You can choose a short transfer to the Sumava Mountains Nature Preserve, pristine mountains on the border with Germany, and take an afternoon ride with us along the picturesque Lipno Dam mostly on a flat bike path. Or, if the weather is good, we can arrange a short canoe or raft trip with a guide for you on the Vltava River, on which this gorgeous town lies. Or you can just simply continue wandering around the town, having a drink or two and some of the great food on offer. Either way, you will not be bored. After a short morning transfer to the village of Brloh, we will ride the back roads towards Ceske Budejovice, the beautiful provincial capital of southern Bohemia and home town of the original Budvar (Budweiser) beer. We tour the brewery in the afternoon before checking in to our hotel near the town's famous main square lined with Baroque and Renaissance buildings. The city center is an ideal location for an evening stroll on our last night in beautiful Southern Bohemia. After a breakfast at our hotel, we load our bikes and board a bus that will take us to Prague where we have a walking tour scheduled for the afternoon. We meet in the evening for our farewell dinner. After breakfast, our bike trip is officially over. Those desiring to spend more time sightseeing this beautiful capital city will stay a few more days. Most of the riding on this bicycle tour is on a flat terrain with the exception of the last day of riding where there are a few small hills. To be able to comfortably complete this tour, you should know how to safely ride a bike and be able to ride between 30-40 km (20-25 miles) a day on flat terrain. However, you always have an option to get a ride in our van if you don’t feel like riding on a given day. For those who’d like to ride a little bit more, there will be optional extra mileage they can ride on certain days. We try to design our route along small, quiet, and picturesque roads with little car traffic and/or bike paths that enhance our sightseeing of the local areas. Any bike is feasible for this tour, road bike, touring (hybrid) bike or even mountain bike if that’s what you are used to. 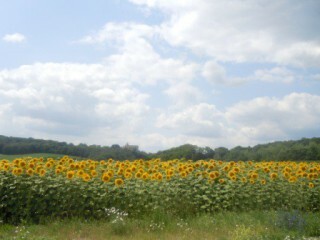 Vienna International Airport is located in the town of Swechat, 16 km east of Vienna. There is ample, easy and fast public transportation (trains and buses) as well as taxi services to get from the airport to the city center. Prague is serviced by Ruzyne Airport, located just west of the city center. There is both public transportation and reasonably priced shuttle service available from Prague to the airport. Your rental bike comes with a rear luggage rack, bungie cord, extra tube and levers, water bottle cage, pump, lock, and odometer. The price for renting a bike for this tour is USD $180 for Fuji Absolute or USD $220 for Fuji Newest or Fuji Roubaix.